I've just taken over a 'lab', AKA the filthy garage that makes numbers, and want to turn it into a Lab. Halp! I've just got a job at a waste oil processing plant. It's tiny. 6 people work here in total, with only myself (the new Site Chemist) and one other using the lab. Currently, the lab is a tiny cupboard containing an old XRF, KF, balance and a couple of spectrometers. Everything is coated in oil. The 'test methods' are stored in the plant guy's head, and there is basically nothing written down regarding SOPs, methods, calibrations, safety etc. As the site chemist, I've been given this cupboard and also the garage that contains the cupboard to turn into a fully functional, legitimate lab. Naturally, the first thing I did was think about safety and, accordingly, I asked the plant guy to stop washing sample jars out using chloroform and disposable nitrile gloves (no, we don't have a fume hood). What next? Of course, this is now my job and I do in fact have a plan, but do any of you guys have any tips on setting up a 'new' lab? Any resources I will find useful? I'd just like to make sure I don't miss anything out regarding safety, good practice etc. e: For info, I'm also responsible for health and safety for the whole site as well as environmental monitoring of everything we dump. Just trying to get a handle on the lab, which is what I know best, before I start making sweeping changes to everyone else's work areas. The lab is a mess because there was no chemist here before now. 2. Failure to properly maintain equipment and to keep complete records of major equipment maintenance. Our investigator found damaged product-contact surfaces on your multi-product equipment. For example, the manhole gasket of [redacted]111 was deteriorating and wrapped in peeling tape. A gasket on the [redacted]102 was also cracked in one area and wrapped in peeling tape. Your SOP/ENG/39-1, Gasket Management for Equipments and Pipelines which are in Direct Contact with the Product, section 4.18, requires you to replace gaskets in critical areas, including gaskets for [redacted]111 and [redacted]102, [redacted]. Your firm was unable to provide gasket replacement records for this equipment during the inspection. Furthermore, the most recent records of your firm checking the condition of the gaskets for [redacted]102 were from January 2017, more than [redacted] before our inspection. This is a repeat observation from our February 2015 inspection. We also note that you have found deteriorating gaskets to be the root cause for finished API particle complaints. Your response is inadequate. You stated that the “involved gasket was immediately substituted” but did not evaluate all other gaskets on your manufacturing equipment. You indicated that you will update your procedure to require a supervisor walk-through to assess product contact surfaces, but did not include sufficient detail (e.g., frequency of equipment inspection). You also failed to address the lack of gasket maintenance records. 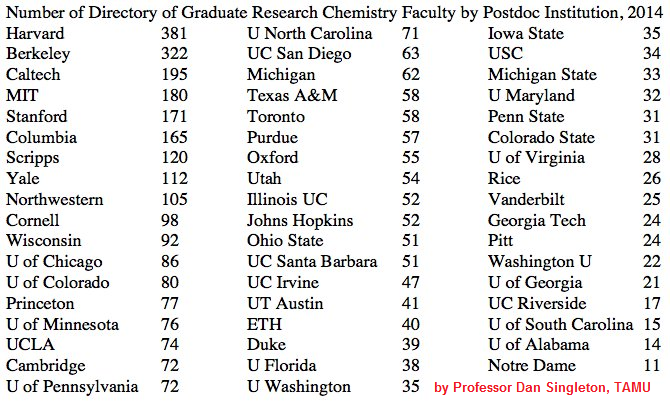 The 2018 Chemistry Faculty Jobs List (curated by Andrew Spaeth and myself) has 521 positions. On February 26, 2017, the 2017 Chemistry Faculty Jobs List had 566 positions. I am a little at wit's end to understand how to help intelligent people like Mr. Kristof see past their clear fear of chemicals, the distrust they have of chemical companies and their seeming dismissal of regulatory agencies. It seems to me that he is all too credulous to the claims of organizations like the Silent Spring Institute that are incentivized to generate as much fear and doubt around chemicals as possible. Ash, on "Why the world needs more Leo Szilards"
Kat Day, on "How bad is BPA, really?" Sustainable Nano on "Can gold melt at room temperature?" The Medicinal Chemist Jobs list has 115 positions. Over at Common Organic Chemistry, there's 14 new positions posted for February 18 and 8 positions for February 20. The Process Chemistry Jobs List has 102 positions. Courtesy of someone at In the Pipeline, the absolute weirdest article about a fake university you will read today. Got a used Dionex ICS 1100? The Staff Scientist, Medicinal Chemist is responsible for designing and synthesizing small-molecules for drug discovery projects in order to advance those programs into preclinical development. Man, those are some kooky cool molecules. is there anything the blockchain can't do? The 2018 Chemistry Faculty Jobs List (curated by Andrew Spaeth and myself) has 514 positions. On February 12, 2017, the 2017 Chemistry Faculty Jobs List had 562 positions. The Academic Staff Jobs list has 19 positions. From reader Augustin Peneau: "White all over the trees and roofs, a peaceful morning at Institut de Chimie des Substances Naturelles (ICSN) in Gif-sur-Yvette (France)"
Looking forward to talking with Dr. Melissa Vaught (a.k.a. biochembelle, author of the longtime blog "Ever on & on") on Saturday, February 17, at 11 PM Eastern. What would you like us to cover? Some topics will be pre-chosen (lots of talk about the life sciences and postdoctoral fellows), some are up to you. ...Pfizer, the pharmaceutical manufacturer, highlights both the demands of the new economy and the shortfalls from the labor force. At Pfizer’s 17 manufacturing sites across the country, a low-level technician once followed a set of scripted steps to mix individual batches of medicine. Those batches would be tested in a lab to ensure each dose would meet the company’s standards. Today, a technician operates computers that mix and analyze new batches of medicine instantly. The technician who once just needed to follow a recipe now needs to know a little bit about chemistry, biology, data analysis and lab work. Call me a perennial skeptic, but this sounds like baloney. We are hoping to start a "CJ's mailbag" for my column at Chemical and Engineering News. Please feel free to write me (chemjobber@gmail.com) if you have a career-oriented dilemma that you'd like me to write about in the magazine. Also, you can submit your questions with this handy web form. Thanks! The Medicinal Chemist Jobs list has 109 positions. Over at Common Organic Chemistry, there's 11 new positions posted for February 12. The Process Chemistry Jobs List has 100 positions. Looking forward to talking with Melissa Vaught (also known as biochembelle), on Saturday, February 17 at 11 PM Eastern about the life sciences, non-bench careers and postdoctoral issues. Merck KGaA, Darmstadt, Germany is currently seeking a highly motivated and enthusiastic post-doctoral researcher with an extensive hands-on experience in multistep organic synthesis to join their Organic Photovoltaics (OPV) Chemistry Team in Southampton, Hampshire, United Kingdom. Your primary role will be to carry out the design, synthesis, purification and analysis of new materials for commercial OPV applications. You will use your ability, experience and knowledge to develop novel materials and an in-depth understanding of the parameters controlling their performance and quality. You will work with a talented multi-disciplinary team of people, contribute to the generation of intellectual property and support product scale-up and introduction to customers. Excellent command of common analytical tools, such as NMR, HPLC, GCMS and GPC. The Regulatory Affairs Specialist I reports directly to the Manager of Global Regulatory Affairs. This position is responsible for assisting with the overall management of matters involving the company’s regulatory initiatives and regulatory compliance, specifically relating to new product development and existing products. Under the direction of the Manager, Global Regulatory Affairs, the Regulatory Affairs Specialist I will work with multiple relevant stakeholders such as the Legal Team, Quality Assurance, Marketing, Sales, and Research & Development to ensure product compliance. The Regulatory Affairs Specialist I researches and provides updates on existing and future key legislation that could affect new and existing product line development to his/her manager for review. Additionally, this individual will be heavily involved in making a positive contribution to implementing key legislative changes including FSMA and SFCA (U.S. and Canadian Regulation Updates). Additionally, this role will be responsible for providing excellent customer service and maintaining positive business relationships with both internal and external customers and/or vendors. Best wishes to those interested. Full link here. Of these, the top 5 schools (by volume) make 9.9% of the graduates. The Academic Staff Jobs list has 22 positions. The U.S. National Institute of General Medical Sciences (NIGMS) announced last month that it will no longer fund a predoctoral fellowship program that supported select chemistry students. NIGMS decided instead to put all of its predoctoral funding toward training grants, which support departments to provide funding and mentorship to large groups of students. The Ruth L. Kirschstein National Research Service Award Individual Predoctoral Fellowship, or F31, was one of few grants that chemistry students could apply for once they had already started their graduate research. Most other grants, including NSF predoctoral fellowships, go to students before they enter graduate school. Marilyn Mackiewicz, now a research assistant professor at Portland State University, says she hadn’t known about the NSF fellowships when she applied to graduate school at Texas A&M University. “It’s kind of sad they are deciding to stop funding the grant,” she says. NIGMS started supporting F31 fellowships in 2015. It awarded around 85 fellowships each year; less than 20% went to chemists. When researchers discover a new chemical in the environment, they need a reference sample of known purity to do further research on the substance. Such reference standards are necessary to calculate concentrations of chemicals in environmental samples, conduct toxicology studies, or carry out environmental fate and transport testing. But suppliers of chemical standards sometimes don’t have novel industrial chemicals, in particular those that are unintentional by-products of manufacturing processes. Researchers can measure the concentration of only some of the fluorochemicals in the Cape Fear River because they don’t have standards for comparison, says EPA scientist Mark Strynar. “There’re people out there that can do that synthesis and they can make these available as chemicals for us to purchase,” Strynar says in a pitch to the chemistry community. “It doesn’t have to be 99.9% pure,” he says. Strynar can be contacted at strynar.mark@epa.gov. Gonna guess that Dr. Strynar could engage Apollo or Synquest for $20,000 or so, but what do I know? Anyone gotten a bonus recently? Funny story by Melody Bomgardner on love and chemists, including Nick Uhlig's excellent cards. "An Exclamation Mark in a Scientific Paper"
Interesting question from th'Gaussling about Sigma-Aldrich's catalog. From Ash, "The Ten Commandments of Molecular (and other) Modeling"
The best article you will read this week, and it's about paper jams. Don't miss it. 1. The top schools do impressively but they are not the only path to get a faculty job. Over half come from places outside of the top 10. 2. The correlation with school reputation is loose. 3. There is an inverse correlation with football quality. I expect that if we looked at graduate school institution, the distribution would be / less top heavy by a good margin. That is, a medium graduate school followed by a good postdoc is a perfectly fine path to a faculty position. This has been studied in the economics literature. It is better to be the best person at a lesser school than third best at Harvard. I am very curious to know what this would look like by decade cohorts. I presume that, for our modern times (2008-2018), the gatekeeper institutions have gotten stronger, not weaker. (i.e. the institutions may be different, but the top 5 will have more than those for the top 5 for previous decades.) Readers, what say you? I think this is instructive to those who are interested in getting funding agencies to pursue academic lab safety as a priority. While professional societies and universities have their place in suggesting voluntary guidelines for safety practices, there's nothing quite like Congressional pressure to move items from policy proposal to policy. 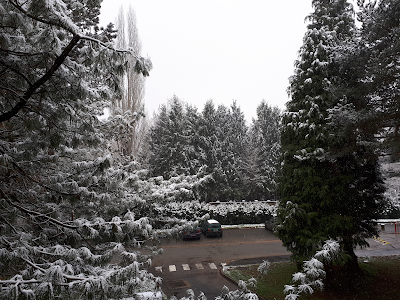 Over at Common Organic Chemistry, there's 7 new positions posted for February 4 and 13 new positions posted for February 7. The Process Chemistry Jobs List has 98 positions. ...However, for this opportunity to be fully realized, chemists should be able to talk to machines. Unfortunately, few chemists can actually code, let alone program a robot or write an algorithm to design and run a better set of experiments. Robotics or AI are rarely part of the chemistry curriculum, even at graduate school. This is especially worrisome considering that a recent report by Dell Technologies estimates that 85% of the jobs that will exist in 2030—when our current students will be in their early 30s—have not been invented yet but will definitely require those skills. The chemical industry will be profoundly transformed by the convergence of technologies that defines the fourth industrial revolution. According to the World Economic Forum, the digitalization of the chemical industry will create revenues in the $310 billion to $550 billion range, reduce CO2 emissions by 60 million to 100 million metric tons, and avoid 2,000 to 3,000 injuries over the next decade. This will require profound adaptations—and on a very short notice—in the workforce, leadership, and organization of a $5 trillion industry. Call me skeptical that one more item should be bolted onto graduate training in chemistry, but learning to code or work with AI technologies seems like a reasonably wise thing for a graduate student in the sciences to do. My name is Paul Humphries and I am currently looking to use my drug discovery knowledge and skills in a challenging and rewarding position within a Bay Area biotech company (see attached for my resume). I am a passionate and motivated scientist with over sixteen years of experience delivering high quality small molecule clinical candidates. For the last seven years I have been working at Reset Therapeutics, where I am currently Chief Scientific Officer and assume full responsibility for all aspects of research and nonclinical development (20 scientists). During this time, I work with the Board of Directors, Scientific Advisory Board and key external opinion leaders to ensure that the organization’s vision and performance meets the needs of the patient population. I was integral in setting up and optimizing the key phenotypic circadian biology platform that yielded the lead Cryptochrome project which progressed from academic hits to First in Human in six years. I also successfully obtained NIH and Michael J. Fox Foundation non-dilutive funding for the Orexin project, allowing science to progress to the point where Reset established a lucrative research collaboration with Alkermes. I have thoroughly enjoyed being a part of the rewarding 23andMe collaboration where we are studying circadian clock genes to improve the therapeutic development of diseases associated with circadian dysfunction. Prior to joining Reset, I had eight years of experience at Pfizer as a medicinal chemist. This time included projects at both an early and late stage, culminating in seven IND submissions across four projects and numerous other projects reaching expedient go/no go decisions. Interested in talking to Paul or knowing more about him? E-mail me at chemjobber@gmail.com for a link to his CV and contact information. Pretty remarkable article, give it a read! Lee Latimer encourages getting involved with ACS. The 2018 Chemistry Faculty Jobs List (curated by Andrew Spaeth and myself) has 506 positions. On January 24, 2017, the 2017 Chemistry Faculty Jobs List had 553 positions. Want to talk starting your new group? That open discussion is here. St. Mary’s College of Maryland invites applications for a two-year visiting assistant professor of chemistry beginning August 2018. Responsibilities include: Teaching Organic Chemistry I and II lectures and labs and other courses as needed in the department such as General Chemistry I and II, a non-majors chemistry course, and courses in the applicant’s area of expertise. Visiting faculty are encouraged to conduct research with undergraduates. The department has a variety of research grade instrumentation as well as dedicated research space available. Qualifications include: Ph.D. in chemistry or a related field and a commitment to excellence in undergraduate teaching. Postdoctoral training and/or teaching experience are preferred. Employment will be contingent upon successful completion of a criminal background check. 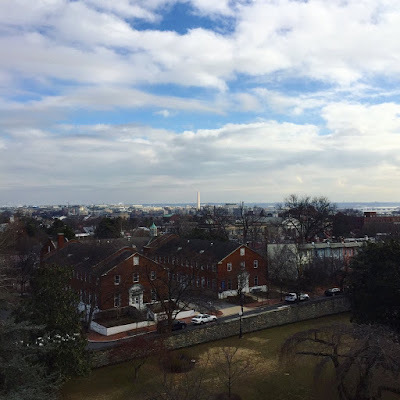 From Safia: "A bright morning on Martin Luther King Jr. Day at Georgetown University. The D.C. skyline never gets less beautiful!" It sounds like Dr. Mitchell is fairly successful at making nut milks out of her proprietary process (and wanders into the plant now and again.) I'm going to guess the majority of carbohydrate chemists do not end up in relatively industrial careers. Don’t just pay people compliments; give them living eulogies. Tell them exactly how great they are, in how many ways. Embarrass them. Here’s a funny thing I have learned by being just a little bit internet famous: it doesn’t matter how many times you hear them, the words “You are amazing, and here’s why” never get old. They do not go out of style. You will be wearing them to your 80th birthday party, along with a dazzling smile. Thanks to this, I've taken a few minutes to write sustained praise for a few of my friends and loved ones and it's been fun. Over at Common Organic Chemistry, there's 16 new positions posted for January 27 and 21 new positions posted for January 31. The Process Chemistry Jobs List has 94 positions.